Six months ago, readers of Ingeniøren witnessed a Copernican revolution in evolutionary biology when we wrote about a new paper, ‘The evolution of eusociality’, published in Nature by the three leading evolutionary biologists from Harvard, Martin A. Novak, Corina E. Tarina and Edward O. Wilson. The paper challenged kin selection theory, and claimed that Darwin’s natural selection and a bit of proper math was sufficient to explain the origin of cooperation and altruism in nature. Measuring genetic kinship and individual fitness was simply not necessary, the authors claimed. Since then, howls of protests have been heard from universities worldwide, including Denmark, where scientists Trine Bilde from Aarhus University and Jacobus Boomsma from University of Copenhagen have lead the choir. When Ingeniøren asked him about the paper in question, the latter commented that it “will not lead to a single new discovery”, and it is unbelievable that Nowak, Tarnita and Wilson would “ignore fifty years of research just to stir up some controversy”. In this week’s edition of Nature, Bilde, Boomsma and 135 other biologists defend their position. They accuse Nowak, Tarnita and Wilson (NTW) of disguising banalities as revolutions, and of wanting to erase fifty years of research. Standing on the outside, looking in, this looks very much like a turf war where the target is the person and not the issue at hand. So, what is the controversy about? NTW claim that a 47 years old and well-established theory of altruism, which explains cooperation, compassion and self-sacrifice among related individuals, is as dead as the epicycles in celestial mechanics. Granted, this is quite an attack on all the biologists who have come to believe that kin selection theory is the only genuine theoretical improvement since Darwin. Kin selection theory was developed in a series of papers, published by the British biologist William Donald Hamilton in 1964, in which he introduced the term ‘inclusive fitness’ to keep track of the sum of favorable genes that are passed down through the generations by an individual and its family. Legend tells of the British biologist J.S.B. Haldane telling his friends at the pub that he would risk his life and jump in a river to save two brothers from drowning. But not if it was one brother only. He would also jump the river to save eight cousins, but not seven. The coefficient of relatedness Hamilton would later call ‘r’, and develop the equation rB > C which simply put says that if a gene for altruism has emerged, it will only survive, if the cost (C) is less than the benefit (B) times the likelihood that a brother or some other family member is carrying this gene. Since Hamilton’s paper, kin selection has been used to explain the origin and structure of complex animal communities such as bees and ants with sterile casts, and kin selection has also been used to explain loose family structures within groups of primates and humans. However, according to NTW’s paper in Nature, Hamilton’s linear summation of the fitness of kinship genes is a mere approximation of the complex dynamics of real populations. Kin selection does not account for habitat structures, synergy and other secondary effects, and is thus a small approximated subset of all the altruistic possibilities that exist within a natural selection model. In other words, kin selection has nothing new to offer compared to the more general and classic Darwinian model. In the latest issue of Nature, critics have made an angry retort. Jacobus Boomsma and colleagues say that the Harvard scientists have overlooked the fact that eusocial behavior (see BOX) only emerged in those clades where mothers are associated with their full-sibling offspring. In other words, high genetic relatedness is a necessary prerequisite for eusociality, and not just one among numerous possible routes to eusociality, as NTW claims. The controversy concerns how social cooperation can arise and evolve in a population of egoistic individuals. In some species, cooperation can become so encompassing that some individuals abandon their ability to reproduce and help others with their offspring instead. This is called 'eusocial' behavior and can be found in ants, bees and termites. In 1964 the British biologist William Hamilton tried to explain eusociality as a result of kin selection: Since my genes are present in the members of my family, it might be beneficial to sacrifice myself for their survival. The term 'inclusive fitness' is the formalized version of this reasoning, and it has played a huge role for the scientific understanding of cooperation in nature. Nowak, Tarnita and Wilson believe, however, that all this kinship and fitness accounting is completely unnecessary, as cooperation and other kinds of altruism arise all by themselves from the mathematical equations that determine the evolutionary dynamics within a population. The only things needed are mutations and natural selections – as Darwin’s recipe prescribes. Other scientists, like Patrick Abbot, Joan Strassmann, Régis Ferriére and Richard Michod, believe that inclusive fitness is very useful and in no way contradictory to standard models of natural selection. And all the opposing biologists agree that kin selection theory certainly provided new scientific insights, for instance about kin recognition, internal control over parasites, mother-fetus conflicts and the dispersion of males and females within a population. It seems a bit strange, however, that a whole army of biologists is needed for the defense of kin selection. It looks as if their arguments maybe aren’t enough. It is also strange that no one bothers to discuss the mathematics presented, and none of the critics admit that a rigorous mathematical analysis of the necessary conditions for the use of inclusive fitness is called for. Nowak and Tamita have analyzed this particular problem in the supplementary material of their paper, and show that inclusive fitness can only be used in quite limited circumstances, for instance, when two different strategies are approximately equal in size, or when interactions are pairwise. Any new model must be evaluated according to its power to predict new things. NTW have therefore tried to formulate an alternative mechanistic model to explore the probability space of social and eusocial behavior. They only use mutation and selection as parameters to examine the interactions. NTW start by looking at a single isolated ant that lives in close proximity to a food source. The ant develops a mutation that makes it feed its offspring instead of itself. Another mutation makes the offspring stay in the nest, instead of leaving it. 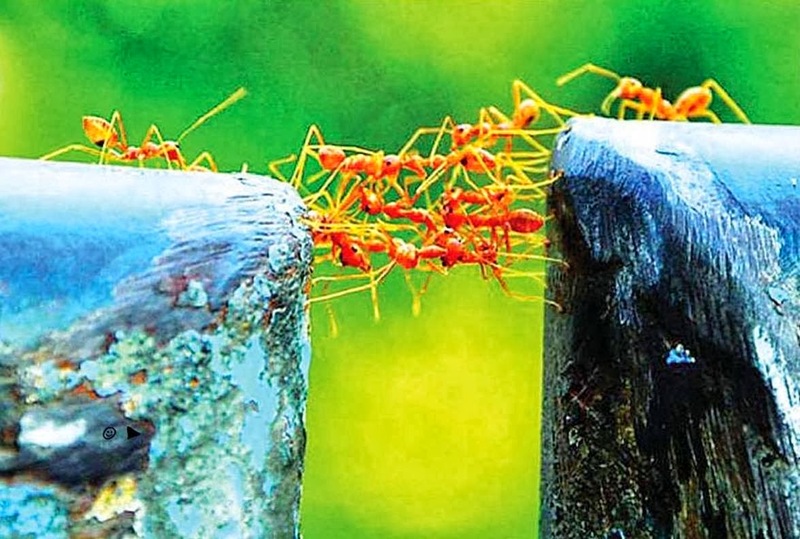 Eventually, these ant families develop instincts for division of labor. One ant digs a hole, and the other ant lays an egg in it. One ant tends an egg, and another brings food etc. The model shows that eusocial behavior can develop in such a fashion, but only rarely. Once it has been developed through numerous mutations, the population be hyper-specialized and stable against invasion of piggybacking strategies. Reproduction will be left to a single queen and the existence of numerous worker ants will be as natural as the existence of white blood cells in a human body. NTW calls the model a labyrinth, as it turns out to be very difficult to obtain true eusocial behavior. This is certainly true for the history of evolution, as true eusocial behavior has been relatively rare in the last millions of years. Their model explains everything that kin selection explains, NTW claim, including all the things that kin selection cannot explain. There is no need to measure genetic kinship and individual fitness. These are superfluous epicycles resulting in incorrect calculations, or, at best, in calculations made more cumbersome. The challenge now is to figure out what parts of the evolution of eusocial behavior can be explained by the NTW-model, and whether or not this can be explained by standard kin selection theory. This may prove difficult, as eusociality is such a rare and complex phenomenon. But the authors say that measurements of the sizes of bee- and wasp colonies, the lifespan of queens, and the number of eggs may all be an indicator of whether kinship or demographic-environmental factors are more important for the stability of the colony. To put the ongoing conflict about kin selection into perspective, we can apply yet another analogy than epicycles: The difference between thermodynamics and statistical mechanics. When Lord Kelvin and Benoît Paul Émile Clapeyron formulated the laws of thermodynamics some 160 years ago, they started from a phenomenological standpoint. That is: they looked at matter and its transformations from the outside, measuring pressures, volumes and temperatures, which enabled them to calculate various heat capacities of gases and fluids. This led to the formulation of the ideal gas law, which soon was regarded as a fundamental law of nature, because experiments had shown it safe to expect gaseous molecules to behave ‘normal’ – that is, ‘ideal’. The theory of kin selection is like an ideal gas law. It expresses the dependencies of the measurable macroscopic state variables in a population of individuals (such as relatedness and fitness). Kin selection theory can be used to formulate Hamilton's rule rB > C and related formulas, which have been shown to be extremely useful in their practical applications. And this is good. There are two problems, though. First of all, thermodynamics was not particularly good at ‘explaining’ phenomena like pressure and temperature. This only happened after Maxwell and Boltzmann developed statistical mechanics, where they showed that temperature is a function of a bombardment of atoms and molecules on a barrier. The thermodynamic variables were thus fundamentally described as a result of classical and quantum mechanical particle movements. This was easier to understand than the numerous empirical formulas that seemed to fall from the sky. The other problem is that biological systems are much more complex than ideal gases. There are numerous ad hoc rules of thumb and phenomenological equations on multiple levels of selection, which makes the theoretical foundations of selection seem more like botany rather than mathematics. The consequence is an endless argument about which aspect is ‘more important’. For instance, biologists have long quarreled about the ‘unit of selection’, that is, whether natural selection takes place on a genetic, cellular, individual or group level. And the arguments often get personal. But according to Nowak, Tarnita and Wilson, these kinds of discussions are not necessary any more. There can be only one level of selection, and that level is the whole social population. Among eusocial ants, the colony supports the genes of the queen. All you need is a suitable number of differential equations, based on Darwin’s principle of mutation and natural selection. In the end, Nowak, Tarnita and Wilson hope that a mechanic-dynamical explanation will put natural selection theory on solid mathematical ground - just like the theory of statistical mechanics did with thermodynamics. Many biologists will probably continue to doubt this – or maybe they just don’t get the math.